The film Sherlock Holmes (US title) or Moriarty (UK title) was released in 1922. Adapted from William Gillette’s play and produced by Goldwyn Pictures, it tells the story of the first confrontation between the detective and his nemesis. John Barrymore plays Holmes as an arrogant, hawkish detective with an unexpected softer side. The Movies Silently blog tells the story of the film’s rediscovery and restoration, as well as offering an expert analysis. This version of Sherlock Holmes was thought lost for decades before being recovered in 1970s. But what was found was not a print. No, it was reels and reels of footage. Multiple takes of the same sequence jumbled out of order… My word! In a virtuoso bit of restoration, Kevin Brownlow was able to piece together the film with some help from its director, Albert Parker. This is not quite Sherlock as he was conceived by Arthur Conan Doyle. We first meet him as a feckless student, mooning around in Cambridge and making notes on himself in a little book. I keep a bull pup. No sooner has he mulled that over, than he is run over by a horse and cart driven by one Alice Faulkner. This knocks all the ratiocination out of him and he falls in love at first sight. Prince Alexis is about to elope with Rose Faulkner, sister of Alice, and the accusation could ruin everything. Holmes soon works out what is going on, and his deductions lead him to the Limehouse lair of – guess who? – Professor Moriarty. Moriarty lets Holmes go, but the future great detective has seen enough to know what he wants to do with his life. Meanwhile, Prince Alexis’ brothers have died in a tragic accident, and he has become first in line to the throne of Ruritania or wherever. He dumps Rose without further ado, and she commits suicide in an unintentionally hilarious climbing ‘accident’ in ‘Switzerland’. We reel forward a few years. Sherlock is now an established detective with rooms in Baker Street. Watson is newly married with servant troubles. Moriarty is still at large but Holmes is hot on his trail. Prince Alexis is about to be married, but the existence of letters between him and Rose could compromise his dynastic ambitions, which has the diplomats in a tizzy. Holmes’ love interest Alice has them and is threatening to publish in revenge for the death of her sister. The letters also make her a target for Moriarty’s gang. Holmes has no interest in helping the blackguard until he sees a chance to help Alice and pin down his enemy at the same time. The film looks great. The restoration must have been good as it is impressively sharp, even via YouTube. It opens with what must have been a bit of a thrill – an aerial view of London presumably shot from a Sopwith Camel or some other ramshackle flying device. There are some lovely interior shots of college sets, Holmes’ digs, Moriarty’s Chinatown lair, and a bona fide 1920s country house. 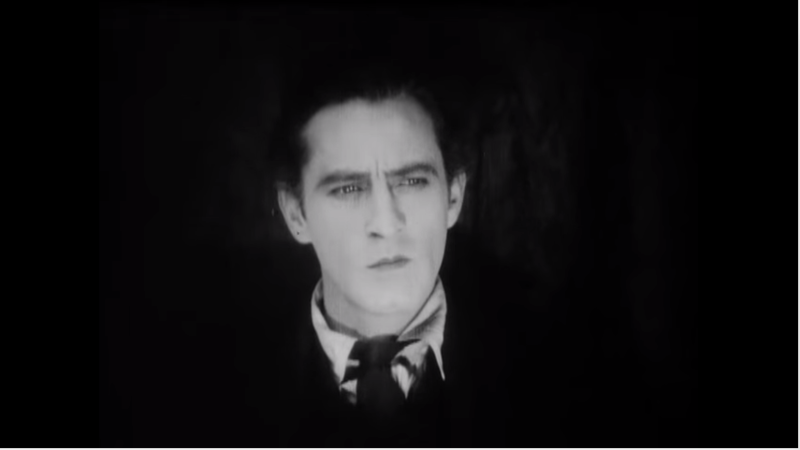 John Barrymore has the perfect face for Holmes (he was known as the Great Profile). The eyes are suitably keen and he has brilliant pipe action. It’s hard to make a final judgement without hearing his voice, of course, but I think he does a very convincing job. Gustav von Seyffertitz’s shambling, dusty Professor Moriarty, on the other hand, is cartoonish – somewhere between Fagin and the Penguin. And his gang are hilarious. 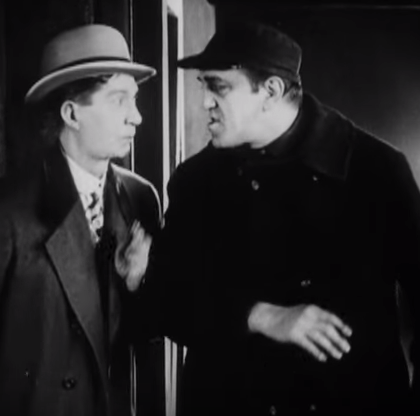 Louis Wolheim, playing one of his thugs, looks so thuggish he must have won the Oscar for Best Thug in a Supporting Role (in fact Wolheim was an engineering graduate from Cornell, spoke several languages and taught mathematics). I was viewing Moriarty as part of the 1922 challenge, so how 1922 is it? Very! We’re so used to seeing recreations of London in the past that it took me a while to twig that this really was London in the past. Once my eyes were open, it was fascinating. There’s something of interest in almost every scene – as a minor example, Holmes sends a maid to summon a cab, which she does by standing on the step and wolf-whistling. 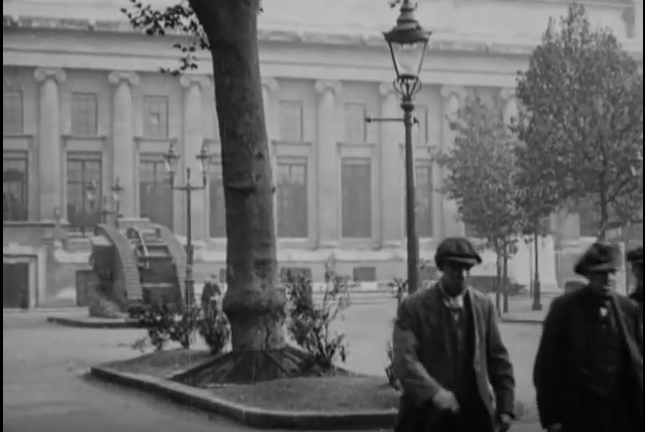 And here’s one surprise – a proper WWI tank displayed outside the British Museum. Much recommended if you want to get a flavour of England in 1922, and well worth a watch if you’re a fan of Holmes. Gallery | This entry was posted in Classic crime round-up, Crime fiction of the year challenge, Crimes of the Century, Film/movie, Sherlock Holmes, Witness Statements and tagged #1922book, 1920s, 1922, Arthur Conan Doyle, Goldwyn Pictures, John Barrymore, Sherlock, Sherlock Holmes, UK, William Gillette. Bookmark the permalink. Fascinating! Definitely sounds worth watching, though falling in love at first sight? That’s not Holmes!!! Oh, I must have a look around for this — sounds tremendous. The filming in London makes this irresistible – love the tank…. Also apparently there were operational tanks in London during the 1926 General Strike. The idea of John Barrymore (one of my favourite actors) as Holmes makes this one rather tempting. 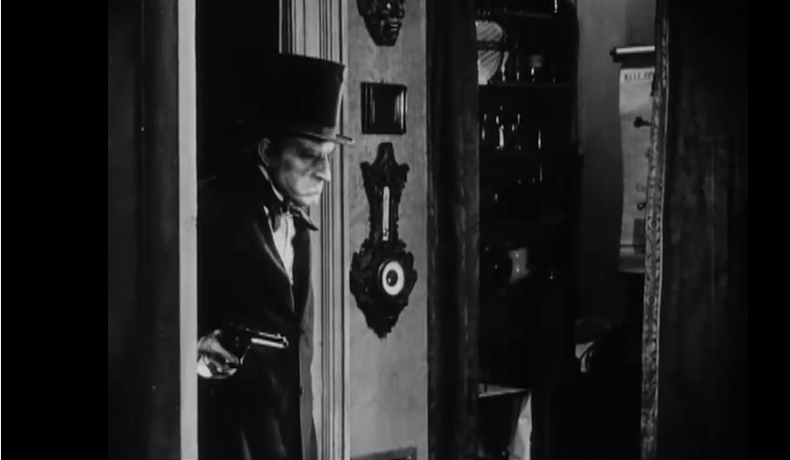 Ordinarily I’d hate the idea of an American as Holmes but in a silent movie – no problem.